Students signed their names to indicate their commitment to change and understanding cultural differences. Anglophone North School District has challenged all schools to become champions of Change and Reconciliation, thus incorporating an indigenous perspective in the District. The first 150 challenge was celebrating Canada’s first 150 years. Now we are embarking into the next 150 challenge, to make it even better. Our purpose in this project is to motivate students (grades 1-8) to take on the challenge. Gretna Green School is promoting acts of reconciliation by infusing Mi’kmaq culture into our library, classrooms and teaching practices. In our library, we are thankful for our recent visitor, a Mi’kmaq Elder, Donna Augustine (Turtle Woman) for presenting ways of the Mi’kmaq culture. The children circled around the campfire, sang songs, played percussion instruments (gratitude for Karen Clark’s provisions), danced, and displayed handmade items in a makeshift longhouse/wigwam. 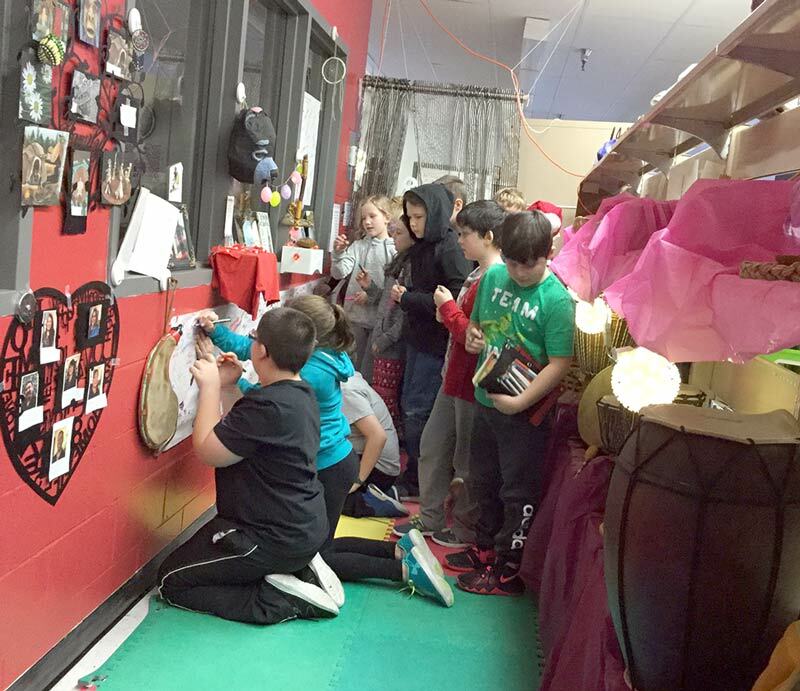 As each class toured the displays in their wigwam/longhouse, they made a commitment by signing their names on a poster made by the Library Creative Design Team. The commitment is that our students want to be caring towards friends and people of our community by learning languages and ceremonies/traditions to understand cultural differences and enhance sense of belonging for all cultures as we learn to become World Class Citizens. In preparation for our special guest’s arrival, Gretna Green’s Learning Library Leaders did research. The Horticultural Team learned about The Four Sacred Medicines, what they look and smell like, where they grow and their medicinal use. Our teachers learned how to make sacred drums and some songs and dances to chant. We plan to invite an indigenous elder to smudge those drums before we use them in our harmony circle. We also performed a cultures celebration on stage at our end of month assembly, where students dressed to represent indigenous cultures from all over the world to the tune of “Celebration – Playing for Change”. Our students love to read quietly in the tepee during library period. A hand-made origami moon lights up the tepee corner where autographs of people who play a key role in helping us to become world class citizens is displayed. As each guest played a role in our project, we presented them with a ‘key’ to our tribe saying thanks for playing a key role in our pursuit of becoming world class citizens. This will enhance our journey to becoming world class citizens. On May 23, we will have our grand Heart Garden gathering of the year, where we will plant hearts in our school/community garden, at dusk, with candlelight, and music to commemorate the lives of every child, especially the ones who went through the residential school experience. This article originally appeared in the spring 2019 issue of Giv’er Miramichi magazine.